So we’ve known for a LONG time that Addyson will be some sort of artist (dancer, painter, etc) but this girl has a knack for drawing right now. Not so much so that we’re like…PRODIGY but she’s VERY detailed in her drawings. She’s in this phase where she wants to draw or color on BLANK paper not lined paper (aka a coloring page), she like to “create her own picture”. A few days ago she drew this picture and I snagged it up before Owen could tear it apart (which he does with most paper’s left laying around). 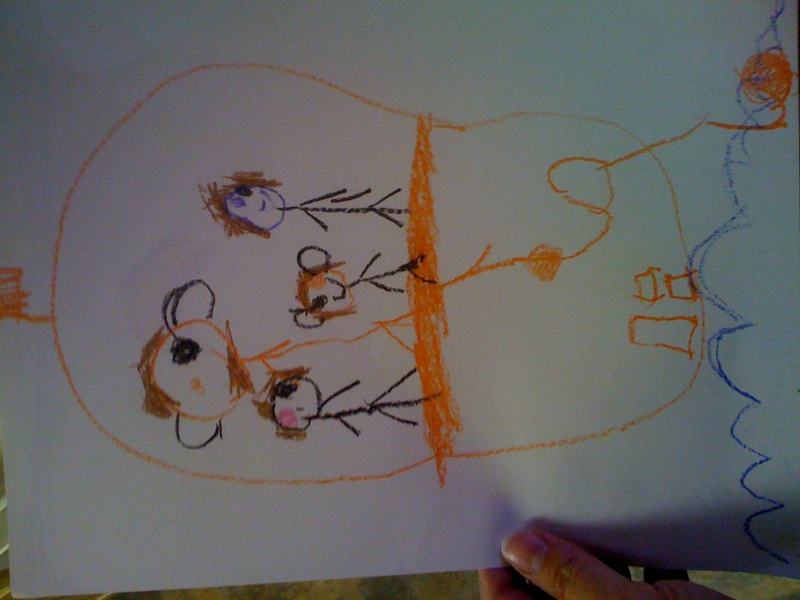 This is picture of our family (from left: Addyson, Justin, Owen and me). We are on a boat in the water (notice the flag atop the boat and the anchor in the water so we don’t float away). Also note that Justin & Owen have big ears because they have no hair covering their ears…I LOVE IT! I love it! Keep it up!